It’s my favorite time of year… the days are getting longer… the Christmas Carols are gone… I have eaten the last of the cookies that are preventing me from eating healthy (no, seriously… they just sit there and yell at me until I eat them! LOL).. and, It’s time to SALE-A-BRATE! This time of the year, it’s all about the FREE stuff. Now, who doesn’t love getting things for free? During SALE-A-BRATION, for every $50 you order, you can earn something for FREE… Absolutely FREE! And, added BONUS – there are now a couple great items you can get for free with $100 order. YAY Stampin’ UP! But then, the question is… what do you do with it once you get it? Hop through these blogs to see a ton of great projects made with the FREE SALE-A-BRATION items. And, remember, these are all things you can earn for FREE with a $50 or $100 Stampin’ Up order. For my project, I chose the BEAUTIFUL PEACOCK stamp set. This is a lovely little set that includes a two part peacock and other leafy images. And, even if you are not a peacock lover per se, the images in this set make a great faux DSP, don’t you think? I layered Bermuda Bay card base with Tranquil Tide and Whisper White. I used Bermuda Bay for the leafy images, Lemon Lime Twist for the little flowers, and Tranquil Tide for the dots. The peacock body and plumage were stamped in Tranquil Tide, colored in with a Lemon Lime Twist marker and fussy cut. The sentiment is in Tranquil Tide and Lemon Lime Twist! The hardest thing about making this card was trying to stamp random leafy images… so they turned out not as random as I wanted, but still looks great, don’t you agree! 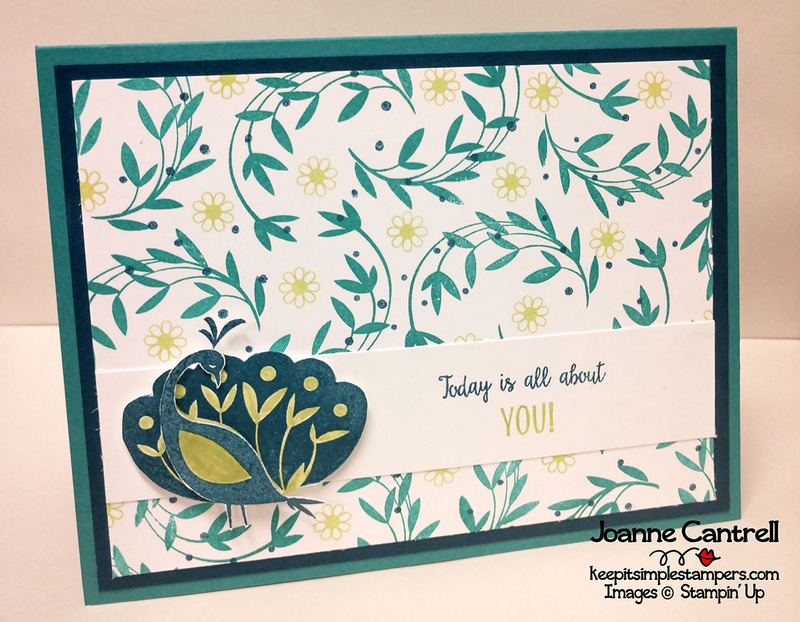 Now, hop along to see what the other Stampers have created for you using these great FREE Products! < Previous Ink & Inspiration Blog Hop – Fun Folds Galore! Next > From Hatchling to Eagle! You did a fantastic job on your “faux designer paper”, my friend! At first glance I wondered which pack of paper your background layer was found! Lovely card! Love your homemade DSP – lovely card. The ‘faux’ DSP is just amazing. A beautiful background for any project. Gorgeous card design. I love the way you created the background and the colors you chose. Love your card and how you designed your own DSP! The color choices are great! I love the stamped layer! Great idea!